Your Italia Artisan Oven and Artisan Oven accessory are perfect for a lot more than just pizza. That’s not to say you can’t cook a dang good pizza in those ovens (because you certainly can); we just mean that they’re useful for so much more. Try steaks, skookies, cedar plank salmon…the list goes on. The only problem is, after cooking all that incredible food, you might be left with a bit of a mess. Whether it’s leftover pizza toppings that were casualties of the cooking process or burnt seasoning from another meal, you want to clean those up to keep your pizza oven in tip-top shape. But don’t worry—it’s a simple process if you do it right. The awesome thing about pizza stones is that they essentially take care of themselves. The stone is exposed to such high heat during the cooking process that it doesn’t usually need additional cleaning. However, if your food starts to come out with a burnt, charred taste from residue left on the stone, here’s how to clean it: -Use a wire brush, Scraper Cleaning Tool, or spatula to remove any leftover toppings, crumbs, or other residue. Be sure to do this before placing any new food into the oven. -For stubborn debris, turn the oven to high heat for a few minutes. This should burn off anything stuck to your pizza stone, making it easy to scrape or brush off afterward. -If you do need to wash the stone, never use soap. Instead, get a clean rag wet with hot water and use your Scraper Cleaning Tool or wire brush to wipe it over the stone while the oven is hot. -You can also remove the stone from the oven after it has cooled and rinse it with hot water. Never soak your stone or put it through the dishwasher. -Think of your pizza stone like cast iron—the stains and discoloration are part of the seasoning you build up to prevent food from sticking. Allow your stone to develop a patina. If your Italia Artisan Pizza Oven isn’t reaching the heat you need or is producing yellow flame, you may need to clean the burner. Sometimes unwelcome guests think setting up camp in your oven is a good idea, and their nests start blocking important components. You can check out our guide to cleaning burners here. You’ll need an air hose, a water hose, a wire hook, or a venturi brush. With stainless steel construction, our outdoor pizza ovens are easy to spot-clean as needed. Getting the surface to shine again only takes a few minutes and some elbow grease. Here’s what we mean: -Wait for your oven to cool completely. -Remove the stone from inside the oven and set aside. -Spray the stainless steel surfaces of your oven with vinegar. -Use a clean, lint-free cloth to wipe the vinegar off in the same direction as the grain of the stainless steel (like wood grain). This will give you a more thorough cleaning and a better shine. -Repeat this process as needed until any stains or fingerprints are removed. -Apply a very small amount of olive oil onto a second clean, lint-free cloth. -Polish the surface with the oil, keeping in the same direction as the grain. Again, you only need a small amount of oil. Your oven’s surface shouldn’t feel sticky or oily. -If this all sounds too complicated, you can always grab a stainless steel cleaner from the store and give that a try. 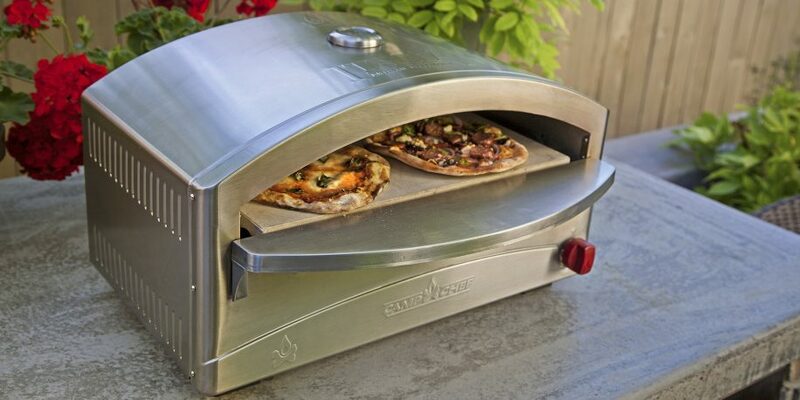 Don’t have an Italia Artisan Pizza Oven for your stove or back patio? We can help you solve that problem. Check out our favorite way to do pizza night right here.